1. Place the sliced steak in a large bowl. Sprinkle the cornstarch over the beef slices and mix to coat. 2. Whisk the soy sauce and sugar together in a small bowl until the sugar dissolves; pour over the beef slices. Mix and marinate in the refrigerator for at least 2 hours or overnight. 3. Heat 3 tbsp olive oil in a large skillet over medium heat; cook and stir the onion and garlic in the hot oil until tender, 5 to 7 minutes. Stir the oyster sauce into the onion and garlic; season with salt and pepper. 4. Add the baby corn, snow peas, carrot, celery, and red bell pepper; cook and stir until the vegetables are slightly tender, yet still crisp, 7 to 10 minutes. Remove the skillet from the heat. 5. Heat 2 tbsp oil in a separate skillet. Remove the beef from the marinade, shaking off any excess moisture; discard the marinade. 6. 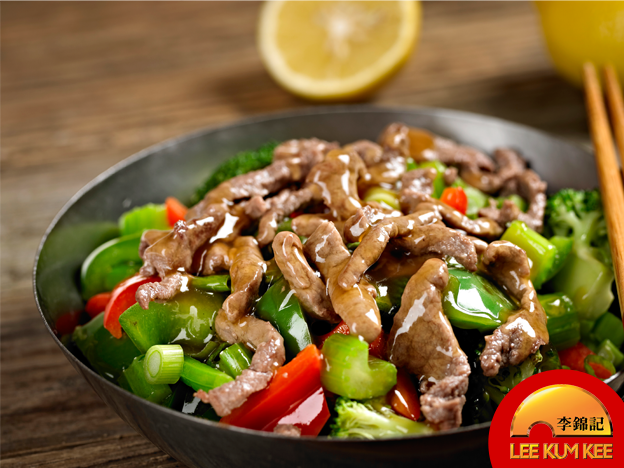 Fry the beef slices in the hot oil to your desired degree of doneness, 3 to 5 minutes per side for medium. 7. Add the cooked beef to the vegetable mixture and mix well. Serve hot.